A port of the Wii resurrection of one of the giants of the platforming genre, Donkey Kong Country Returns 3D is Retro Studio’s take on the series that Nintendo and Rare crafted twenty years ago. Cartoonishly-proportioned crabs, birds, and pigs mark the island backdrop, which is divided in many separate ‘worlds’. In the vein of both its DK predecessors and Mario Bros., these worlds include multiple stages, some of which are accessed via keys that can be purchased from Cranky Kong’s shop, along with health bonuses, temporary invincibility potions, and extra lives. Each stage focuses on the simple goal of reaching the opposite end, while throwing a decent number of foes and environmental hazards in the path of DK and Diddy. 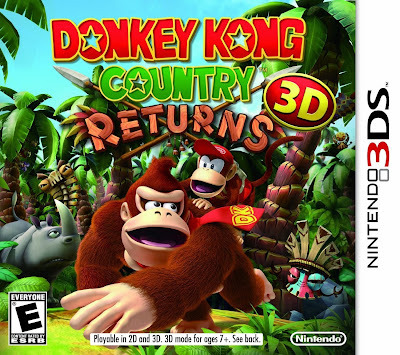 With a handful of exceptions, Donkey Kong titles have never been revered for their stories, and this 3DS port follows in that tradition. A group of tiki masks have hypnotized some of the local wildlife into doing their bidding and attempting to stop DK and Diddy. Aside from Cranky’s advice and power-ups, Pigs providing checkpoints within each stage, and the occasional assist from Rambi the rhinoceros, the Kongs are effectively on their own with setting things straight on the island paradise. The break from relying on King K. Rool is certainly welcome, and allows Retro’s personal artistic vision to shine through more brightly than if they had simple opted to retread said territory. The soundtrack offers solid updates to classic DK tunes, though they tend to be recycled frequently in the many stages. Each stage includes at least one or two hidden areas where players can bounce around or climb up moving platforms to try and gather up bunches of bananas, puzzle pieces, and extra lives. These aforementioned puzzle pieces, as well as the ‘KONG’ letters, are the game’s sole collectibles, but do extend the replay value of the game by a decent margin. Boss fights cap off each world, and become progressively more challenging due to both their mixing up enemy attack and defense patterns, as well as their speed, range, and quicker responsiveness. Some bosses require a direct approach, while other fights will ask that DK and Diddy make use of the environment and its hazards to quash the opposition. The game’s greatest misstep lies in the one gameplay aspect it opted not to update, but rather take a couple of steps backwards in time with – that being the reliance it has on twitch-based memorization patterns. While these were a common occurrence during the 8-bit and 16-bit eras, they effectively nullify a game’s learning curve in the modern era of gaming, asking less that you play the game, and more that you follow its instructions in the most direct way possible. This aspect is not strikingly apparent during the first couple of worlds, but as DK and Diddy forge deeper into the game, this pattern of merely ‘going through the motions’ drains much of the fun factor from Donkey Kong Country Returns 3D. The 3D effects are handled in a manner that works for a game that is being ported from a home console to a handheld, adding an extra degree of depth perception, but in truth are really nothing to write home about. The 3DS’ internal gyroscope, which perhaps could have been utilized sparingly for mine cart or rocket barrel segments, is left an untapped resource. While perhaps not the weakest platforming experience on the 3DS, Donkey Kong Country Returns 3D feels decidedly lackluster in the company of Kirby: Triple Deluxe and the recent Super Mario titles.